If you've been living under a rock and have not heard of Airbnb here's the gist: Airbnb is an online marketplace where you can book a unique place to stay while travelling OR list your own place so other travelers can crash at your place. It's cost effective, simple and can line your pocket with cash. In one sense they are the world's largest fully independent collection of hotels and/or hostels. They currently have listings in 34,000 cities in 190+ countries...and that includes more than 600 real life castles. How cool is that?!?! Don't get me wrong, I'm still a Marriott fanatic. They are my preferred hotel chain, but with over 1,000,000 active listings Airbnb has a reach that Marriott can't compete with directly (plus they have over 600 castles). On top of that, you can make easy money listing your house or apartment on Airbnb. When we were traveling in a remote area along the Azuero Peninsula in Panama we searched the usual websites for hotels and came up empty. Then I tried Airbnb. They had several options in the area and one of them was a totally cool, bargain priced, beach hostel. If I had not used Airbnb for that trip we would have missed this amazing spot. It was also the only service we were using at the time that showed a place any where near where we wanted to stay. We can thank Airbnb for precious memories of our first Christmas as an expat family. Sometimes you travel to a new place and never get insight into how the locals live. What's a typical neighborhood like? What's in a typical kitchen? Where do locals shop for groceries, etc.? With Airbnb you have the option to stay in someone's house or apartment. This can be an extremely cool way to get to know a place and learn more about the culture of an area first hand. There are multiple ways to save money using Airbnb. You can filter listings by price point, and many are cheaper than an average hotel. Of course, any time you have a kitchen, you can save a lot of money by not eating out as much. The hostel we stayed at in Panama had a kitchen that we used several times a day. 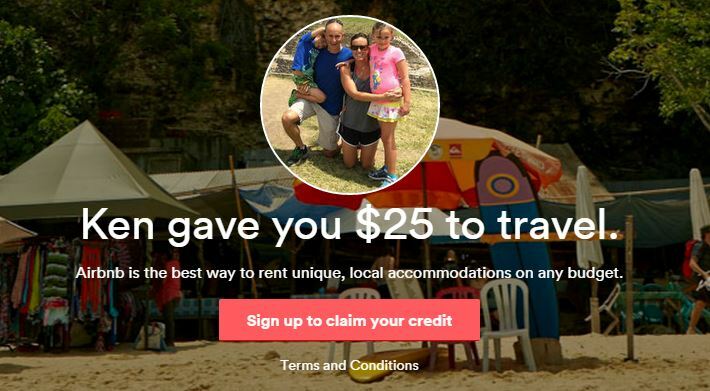 Lastly, new Airbnb customers can save money by clicking on the link below when signing up. Spend $75 and you get a $25 credit to use on your next trip. Disclosure, we also receive a benefit if you use our referral link but it's of no cost to you. Take a good look at the pictures of the place. Make sure it looks like a place you want to stay. Read the description of the property carefully. Do they accept pets or smokers? Does the listing have parking? Make sure it is in alignment with the kind of place you want to stay. Communicate with the owner in advance to clarify any questions you have. Is a microwave important to you? If it's not in the listing, ask the owner. They may have one, but don't assume they do. Check out previous reviews of the property. Yes, you can rent your house or apartment. You can rent it out by the day, week, month, or whatever is convenient for you. It's easy to do and you get paid fast. The thought of having strangers stay in your house might sound weird or even scary but remember the first time you used eBay or Craigslist? It's a little like that (except this is your home). Last week was a big week for partying in our town in Guatemala, since we were headed out of town we did not want our place to sit dormant while we paid rent. We decided to list it on Airbnb. Two couples from Guatemala City were interested and booked our place for two nights. They showed up on time, respected the rules of the house and left the place almost as clean as when they arrived. Airbnb took care of collecting the payment and deposited the money in our bank account the day after they left. The whole process was friction free and it paid our expenses for our week away. Since we rented our house, we had to prepare it for guests. We decided we wanted to give them an empty closet and refrigerator to use (both are common for Airbnb rentals). This meant we had work to do. We spent time purging clothes we no longer wear and tossing leftovers that had been in the fridge too long. Since we knew we were going out of town for a week, we bought fewer groceries which meant the fridge was also ripe for cleaning. Is this work? Yes, but is it work you should be doing on a regular basis? Yes! But this time you can get paid to do it which is a double win. Do clean and purge, and do it well. Get rid of the clutter, clean the bathroom, mop the floors, etc. Remember someone is essentially paying you for a hotel room. Take your time writing your listing. Make sure it accurately conveys the do's and don'ts of the property as well as what amenities are included. We checked out other listing to get ideas of what to say and found that very helpful. Vet your perspective customers. People have to request to stay with you. You can turn people down. Check out their prior reviews on Airbnb. Are they favorable or non-existent? If they are a first time user you might want to consider requiring them to become 'verified' by Airbnb. Verification is just another step in which they have to provide a little more info to Airbnb. You can also trade a few emails or ask to talk with them before confirming their reservation request. Assign a security deposit to the listing if you feel it is necessary. Don't get greedy. Everybody would like to have top dollar for their property but will you take less? If so, you should consider lowering your asking price or you might get no takers. Airbnb is not a place for bidding. Also, do you really need to have an additional cleaning fee? Just give all of this some thought. Communicate, communicate, communicate. When someone requests to book, answer them in a timely manner. If someone is staying at your property and calls you, respond quickly. Remember you are now in the customer service business temporarily. Obviously we are fans of this service and see it as a popular model for both renting a place and renting your own place. If you've not checked out Airbnb, you need to. Just follow this link. Have you used Airbnb? How was your experience?